RVnGO is America's best marketplace to find RVs to rent in Maine. Find your RVnGO! Model: Aspen Trail 40 Ft.
2015 Thor Dutchmen 27 Ft.
For those who enjoy the spray of the sea and are looking to partake in a classic New England tradition, a boat trip to Cabbage Island is a choice day time activity. It a unique experience offered June through the weekend post-Labor Day. Not only will you delight in spotting many uncommon birds and wildlife around the island, you get to partake in a traditional Downeast Clambake at Boothbay Harbor cooked on the waterâ€™s edge. Guests are welcome 7 days a week during the season. At the northern entrance into Portland's outer harbor, there is a jagged finger of rock, one-quarter mile long. This jutting landscape first hosted a navigational aid for those at sea in 1855. Today, Ram Island Ledge Light sits as a ninety-foot tall rock beacon. A stunning landmark, it was built in 1905 and makes for a lovely picture. 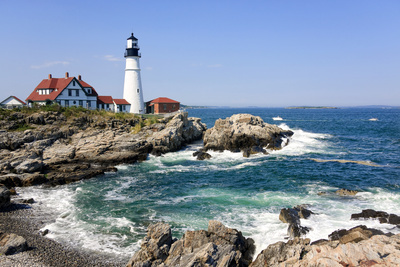 Visit the Maine Lighthouse Museum while you are there, too, as you travel the shores of Maine in your RV rental. Found just eight miles south of busy Portland, Crescent Beach State Park offers a picturesque escape while not being too far away from the attractions accessible in the city. The rec center opened in 1966 and highlights sandy shorelines, saltwater tidepools, and fun events for beachgoers, nature spectators, and fishing and water sports fans. Many travelers appreciate picnics, rowing, and walking around the mile-long, sickle molded shoreline when passing by in their RV trailer rental in Maine. The Park has a spot where you can relax for two or three-day stay in your Maine RV rental. A considerable measure of RVers drive their RV rentals in Maine to Bangor to participate in one of the most seasoned state fairs in the nation, the Bangor State Fair. The Bangor State Fair is a ten-day event that happens at the end of July to early August. Known as a game and farming get-together of the locals of Bangor, everybody is invited to the celebration. Carnival highlights include games and rides, shows for all ages, the Maine logger show, Stoney Roberts destruction & demolition derby, loads of food and drinks, horse shows, and fireworks display. Make a point to bring the whole family with your trailer rental to Maine. Rent a RV and travel to Maine to enjoy the state's biggest one-day celebration, The Old Port Festival happens each June in the city of Portland. It highlights live jazz, acoustic, blues and bluegrass music in eight locations, with Maine-influenced specialists, There will be games, food from all over, and a foot parade down Exchange Street. Old Port Festival has been attracting a huge number of tourists from throughout the nation for more than 40 years! You can lease a RV to Maine, any time of the year to have an amazing vacation. Think how much fun you will have in your RV rental from RVnGO enjoying a lobster roll picnic on the shoreline!